None of the 22 films in the running for the top prize were directed by women. 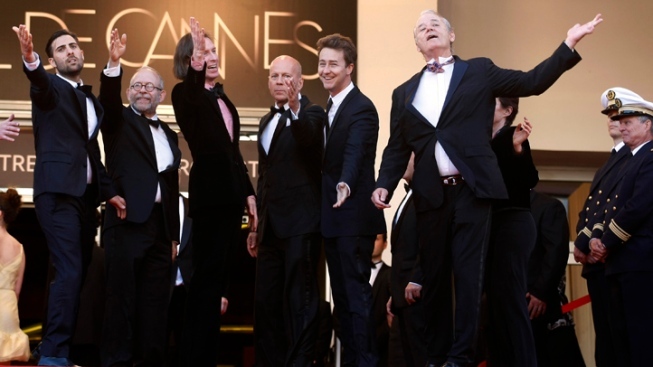 From left, actors Jason Schwartzman, Bob Balaban, director Wes Anderson, actors Bruce Willis, Edward Norton and Bill Murray at the opening of the Cannes. At this year's Cannes Film Festival, there are directors in their 30s and their 80s, directors from Europe and North America, directors from Asia and the Middle East — but no women. Not, at least, among the 22 films competing for the coveted Palme D'Or, an absence that has drawn criticism from feminists — and a defense from the festival's artistic director. Thierry Fremaux argues it's not his fault that filmmaking remains primarily "a male sport." "I don't select films because the film is directed by a man, a woman, white, black, young, an old man," said Fremaux, who has led the festival since 2001. "I select films because I think they deserve to be in selection. "It wouldn't be very nice to select a film because the film is not good but it is directed by a woman," he added. Last year, four female directors made the main competition lineup, including Britain's Lynne Ramsay and Australia's Julia Leigh. The festival's critics say this year's choice suggests that was a blip, rather than a trend. The French feminist group La Barbe took the festival to task for excluding women with a petition published in Le Monde and The Guardian newspapers. The letter, whose signatories included filmmaker Virginie Despentes and writer Nancy Huston, said sarcastically that the lineup "sends a powerful message ... Above all, never let the girls think they can one day have the presumptuousness to make movies or to climb those famous Festival Palace steps, except when attached to the arm of a Prince Charming." It's not that women are in short supply at Cannes. They abound — most prominently on-screen and on the red carpet. The French Riviera film festival is synonymous with female glamour, from Sophia Loren and Monica Bellucci to Penelope Cruz and Angelina Jolie. Women also are plentiful in off-screen cinema roles, from the traditional enclaves of hair and makeup to film editing, where experts like Martin Scorsese's longtime collaborator Thelma Schoonmaker are considered among the best in the business. "There are a lot of women (in editing) because they are close to the directors, and the directors are men," said Colette Farrugia, a film editor with 30 years of experience in the business. Female feature directors remain rare, despite high-profile successes like Kathryn Bigelow, whose war film "The Hurt Locker" won six Academy Awards, including best director — making her the only woman ever to win that prize. Research by the Center for the Study of Women in Television and Film at San Diego State University found that just 5 percent of last year's 250 highest-grossing films were directed by women, a lower level than a decade earlier. Some have suggested forms of affirmative action, or quotas, for female filmmakers, but directors oppose the idea. "I would absolutely hate it if my film got selected because I was a woman," said British director Andrea Arnold, whose films "Red Road" and "Fish Tank" both won prizes at Cannes. "It's true the world over in the world of film, there are just not that many women film directors. That's a great pity and a great disappointment." Fremaux acknowledges that cinema is still male-dominated, but says "it's not the fault of Cannes." He stresses that female directors are not entirely absent from the festival, which runs Wednesday to May 27. The secondary competition, Un Certain Regard, features two, both French: Sylvie Verheyde ("Confession of a Child of the Century") and Catherine Corsini ("Three Worlds"). There are also four women on the nine-member festival jury. "If we really want to solve the problem it's not here, and not in accusing Cannes. It is in asking the same question in January, everywhere in the world and every month," he said. Kate Kinninmont, chief executive of industry group Women in Film and Television, agreed that criticizing Cannes, or imposing quotas, would not solve the problem. "I think it's a big cultural thing that's going to take a long time," she said. "We've got a lot of very talented women making shorts. They will be the next generation that will start to change the balance. "It's only going to be done by the strength and confidence of women going forward."